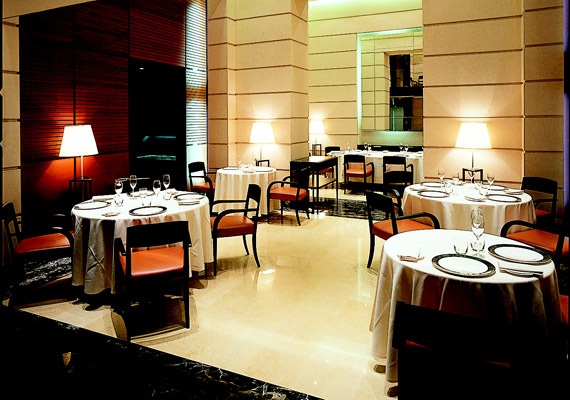 Boasting two Michelin stars within three years of operation Cracco-Peck was a runaway success from the onset. �The Temple of Italian Gastronomy� the restaurants premier location, just along from the Duomo couldn�t be more apt. Done in an elegant style that favors cool earth tones the dining room is a picture of panache and refined class. Chef Carlo-Cracco specializes in revisting and revitalizing Milanese classics -- Cracco's take on saffron risotto and breaded veal cutlet should not be missed. Be sure to save room for the light, steam-cooked tiramisu. Pig Snout with prawns and green tomatoes is an decadently adventurous dish for the true foodies, a dish even the like of Tom AIkens would be proud of. If you can't decide, opt for the gourmet menu, a six course gastronomic journey that delights at every turn. Cracco�s art of cooking is accentuated by a large choice of wines, more then 1800 labels, the result of an extensively accurate search through all the best wines existing on the world market.